G-CAS! Sew Excited! : UFO Challenge Update!! Well, I have been sewing but just not what I set out to sew. Actually, I was in the process of finishing that "yellow" thing mentioned in my last post when my wonderful son approached me and said: "Mommy, can you make me some harem pants?" (Roller Coaster Haven). I thought the park would be perfect for him to wear the harem pants so, I made them. I got a chance to shop for fabric too. tee hee hee. 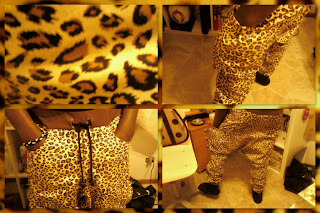 These pants are rated 3 and I did view B. I didn't think they were hard to make just a little time consuming. I would guess the godet's are what would bring the skill level up. We did three fittings and no muslin. I did, however, modify the pants. I went with a fly zipper instead of button fly, a ribbed waistband with elastic and drawstring instead of a regular waistband and I added elastic around the ankles. He insisted on an animal print so, I found a nice leopard print shirting from Joann. It's a poly/cotton mix and pretty thick so it worked well for this project. KC is normally a 36 in RTW. I cut the 40 so we would have room in the legs and the waist since I was adding elastic in the band. It also helped exaggerate the baggy crotch. When I finished them he was ecstatic! I got two hugs, three kisses and lots of smiles! Aw shucks! - He's still my best customer! He wore them to the park and OH! what a special day! KC's very first ride ever on a Roller Coaster!!!! After 7 more coaster rides that day - park history was made! And we got 5 complements from passing little gurls. KC and My Nephew Nathan on the Gate Keeper!! I see the signs that you are right! :-) He's still my baby!